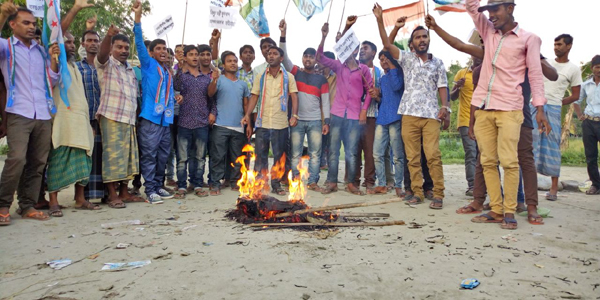 Bongaigaon district National Students’ Union of India (NSUI) burned effigy of Prime Minister Narendra Modi at Nambarpara in the district on Sunday evening. This is in protest against Modi, who recently declared that every household across the country would have access to electricity. The NSUI activists shouted slogans – ‘Narendra Modi liar’ ‘Narendra Modi hai-hai’, ‘BJP hai-hai’, ‘Assam government hai-hai’, ‘Power department hai-hai’ etc in protest against Modi’s fictitious claim through the tweet. Nambarpara 1, Nambarpara 2, Nambarpara 3, Nambarpara 4 and Chakla regions in Bongaigaon district have no access to electricity.